How's that belly doing by the way? So exciting! Leslie! It turned out beautifully! The quilting on the color-squares is outstanding. It must require so much patience. I've only made one quilt....and I sent it away for the quilting (I think this is a big No-No in Quilter Land), I don't think I could do it myself. This is so inspiring! Thanks for yesterday, I had so much FUN - all tucked away, it felt like I was in another world - so, so good. The colours you have chosen are lovely, so different from my usual colour choices, perhaps I will have to try some new combinations. what a beautiful quilt....it looks so cozy and comfortable! shael, i sewed all of the top pieces together, then sandwiched some cotton batting between the top and back before quilting it all up. the cotton batting shrinks up in the most lovely way to create the wrinkly goodness! 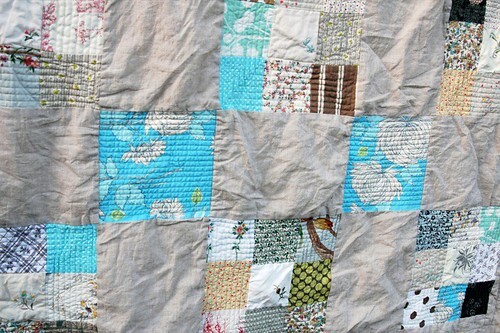 OMG your quilting is gorgeous!! 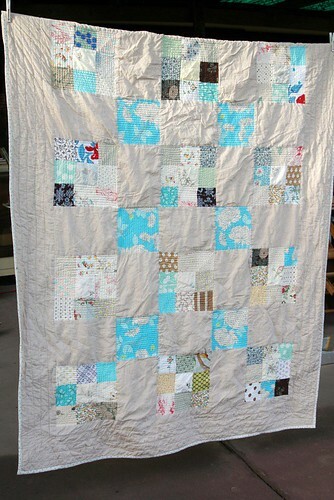 The baby quilt is so fine - lucky little person on the recieving end :) You have inspired me to maybe soon give it a go..I too have been deliberating the quilting for quite some time.